Open up a trunk full o’ spoilers! Arnold Schwarzenegger confirmed he’s still interested in making another Conan the Barbarian movie in a video posted to Twitter to promote Marvel’s new Conan comic. It’s a movie that I’ve wanted to do for a long time. Let’s do it. According to Variety, Thomas Middleditch has joined the cast of the Zombieland sequel in a currently undisclosed role. Phil Lord and Chris Miller will direct a film adaptation of Lee Bacon’s upcoming novel, Last Human, for Sony/Tristar. According to The Wrap, the film is described as a “reverse E.T.” and concerns three extraterrestrial robots befriending a human child. Deadline reports a film adaptation of Joe Hill’s short story, Faun, is now in development at Netflix. The story concerns a big game hunter going after mythical creatures after discovering a gateway to a supernatural realm. TV Line reports that yes, Game of Thrones producers D.B. Weiss and David Benioff are still contracted to “write and produce a new trilogy of Star Wars films” for Disney. Jared Leto’s Morbius is now filming in London. The latest TV spot for Us contains a few milliseconds of new footage. Suicide Squad’s Karen Fukuhara stars in the trailer for Stray, a “supernatural Neo-noir” from director Joe Sill. Skybound Entertainment is now developing an animated series based on the mobile RPG, Summoners War, according to THR. Chris “Doc” Wyatt and Kevin Burke have been hired to write and produce. Sad news—Counterpart has been canceled at Starz after two seasons, although according to showrunner Justin Marks, there’s a chance a new home could be found for season three. In happier TV news, Hulu’s Craig Erwich stated Runaways is likely to be renewed for a third season while talking to reporters at the Television Critics Association. We’re really happy with the performance of Runaways, both creatively and in terms of its performance, and we’ll have an announcement shortly. Coming Soon has our first look at Jack Bannon as a young Alfred Pennyworth. KSiteTV has photos from the pilot episode of Doom Patrol. Head over there to see the rest and check out our review here. KSiteTV also has photos from Charmed’s March 3 episode, “Manic Pixie Nightmare”. More at the link. Elsewhere, Skybound has our first look at Dwight as he appears in the fifth season of Fear the Walking Dead. More images at the link. Diggle teams with Diaz in the trailer for next week’s episode. 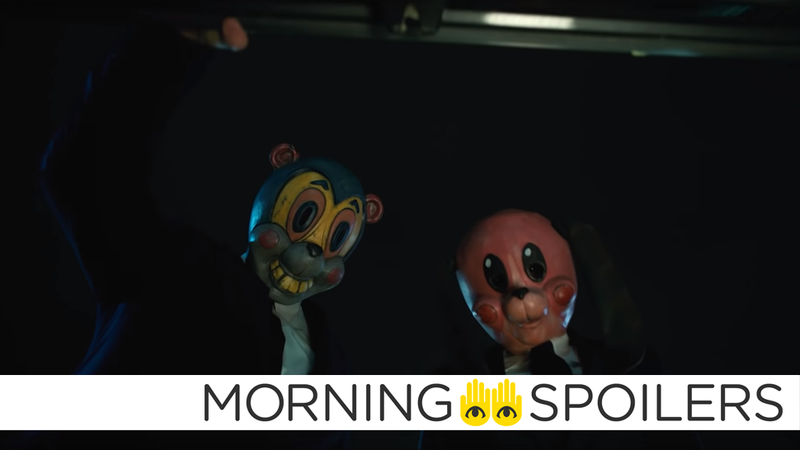 Finally, the latest trailer for The Umbrella Academy introduces its main villains- Hazel and Cha Cha.